The Petit Gascon-Saintongeois is a scenthound that was developed to hunt for hare and rabbit, primarily in packs. The ‘Petit’ in their name is not a reference to their size, but rather to the fact that they hunt small prey. Today they are an extremely rare breed, kept almost exclusively by hunters. A larger version exists, the Grand Gascon-Saintongeois. 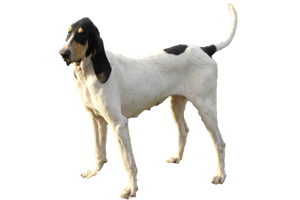 Bred down from the larger Grand Gascon-Saintongeois, the Petit was likely created with crosses that involved the Ariégeois and other briquette (medium-sized) French hounds in the 20th century. Is the Petit Gascon-Saintongeois Right for You?